London E-Management Review - is londonemanagement.com scam or good forex broker? London E-Management Review - is it scam or safe? London E-Management is an offshore broker. Your money is not safe. London E-Management is one of these shady forex brokers whose offer is utterly unclear. It has not specified any trading conditions whatsoever on its website, and what is worse, its corporate situation is not any different. So, make sure you read our review before investing any money. 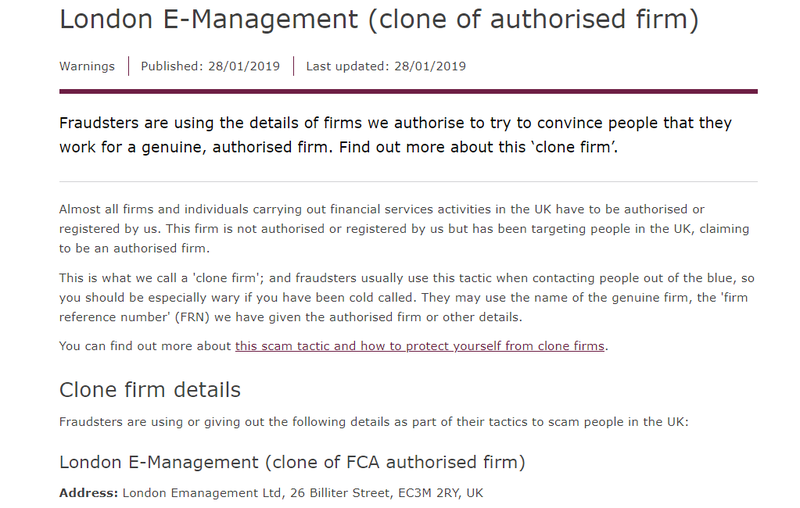 Furthermore, the FCA said that this is a popular scam tactic when contacting people out of the blue, and advised investors to be especially wary if you have been cold called by representatives of London E-Management. As we mentioned in the beginning, London E-Management has not specified the minimum investment it requires, what leverage levels it provides, nor the minimum trade size. The broker only advertises spreads as low as zero on its website (which turned out to be untrue). Such lack of essential trading information and transparency is yet another worrisome sign, as it’s typical for con-artists. London E-Management claims to offer its clients the ever popular MetaTrader4, as well as some web trading platform. However, when we opened an account with the broker, the only option available in terms of trading interface, was SM Web Trader. London E-Management’s SM Web Trader platform. Click to view larger. Although the platform is not bad, it cannot be compared to the industry’s leading MT4, which provides more than 50 in-build analysis indicators, superior charting package and is designed to support automated trading strategies (Expert Advisors). When we read the broker’s terms and conditions, we stumbled upon several clauses, which seem unfavorable to London E-Management’s clients. First, the broker states that withdrawals and deposits might incur additional fees, without specifying any amounts. Second, E-Management reserves the right to delay withdrawals for up to 30 days (or more). Scammers often delay withdrawals and make up different reasons for this, but essentially their purpose is the client to fail to file a chargeback within 6 months of the initial deposit (which is the official deadline for such claims). London E-Management is a forex broker that shares little information about itself and its offer, but our thorough investigation on the matter revealed that its trading conditions are actually not that good. What is worse, we have major concerns about the broker’s legitimacy – it is not regulated and was even flagged by the FCA as a clone firm. This inclines us to suspect that London E-Management is just one of the many con-artists on financial markets, so you’d better not risk your hard-earned money on it. As always, we would advise you to invest in financial services providers regulated by reputable governmental agencies such as UK’s FCA or Australia’s ASIC. No news about London E-Management . Check back later.